Were big fans of the Tempo Smart Calendar app for the iPhone, and a recent update has ushered in a very nice feature. In partnership with Speek.com, version 1.3 allows users to create and dial into a free conference call without even leaving the app. That is a big change from the usual hassle of dealing with a call-in number and PIN. 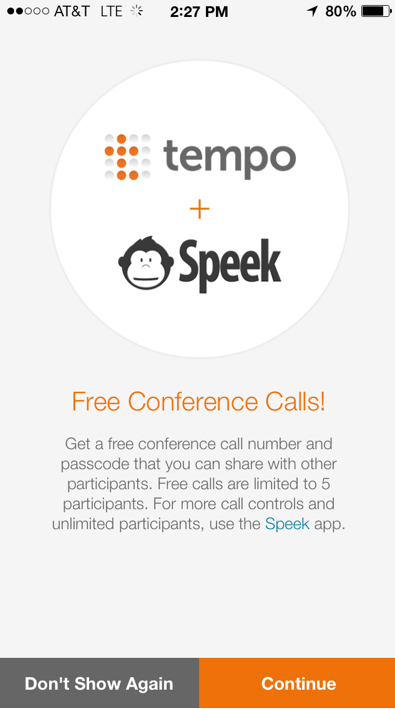 Speeks technology works by providing a Web-based conference call line that is always open. With the update, users can also see todays date on the app icons badge. That can be turned on by heading to Tempo Settings and then Preferences. Finally, there is a new custom sound to easily distinguish alerts from the app. Designed for the iPhone/iPod touch, Tempo Smart Calendar can be downloaded now on the App Store for free. The smart calendar has made some major improvements so far in 2014. A February update brought People Insights into the mix. That gives users a complete picture of the person that they are meeting with by displaying information like all mutual LinkedIn connections, Facebook friends, and even mutual Tempo contacts. Version 1.2.1, which arrived last month, added People Insights integration with Google+, Klout, Flickr, and About.me. If youre looking for a free and robust calendar app, I highly recommend Tempo Smart Calendar. Its a great alternative to Fantastical 2 for the iPhone and iPad.